By Nour Galaby, Data Enthusiast. Instagram is the largest photo sharing social media platform with 500 million monthly active users, and 95 million pictures and videos uploaded on Instagram everyday. It has a huge amount of data and huge potential. 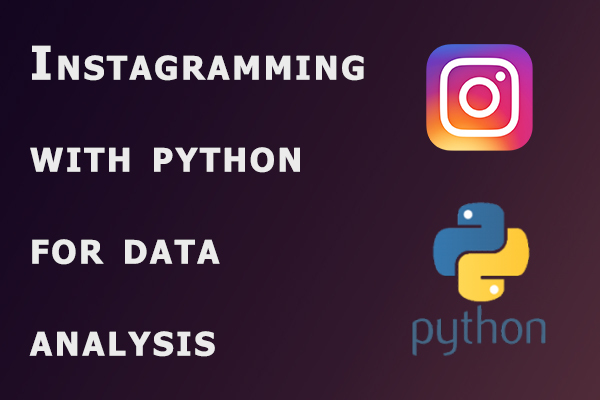 This guide will help you view Instagram as a source of data and not just a platform, and how to use it as a developer for your projects. Instagram has an official API but it is outdated and is currently very limited in things you can do with it. So in this guide I will use LevPasha’s Unofficial Instagram API, which supports all major features like like, follow, upload photo and video, etc! It is written in Python, but I will focus only on the data side. If successful, you should receive a "Login Success" message. As you can see, the result is in JSON format, containing all of the requested data. You can use any advance viewing tool (Notepad++) to view the JSON and explore it. Now let's do something more interesting. We will request the last posts in the timeline and view them in our notebook. Viewing images in a notebook is very useful and we will use those functions later to view our results, as you will see.